When we are out working around the house, or running off to work early in the morning it's super useful to have a quick microwaveable snack that you can grab out of the freezer, and eat within 3 minutes. I'm really not a fan of fast food on the whole - so I try to find my own alternatives. 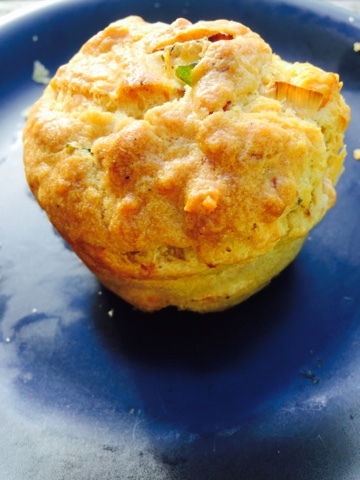 Muffins are super easy to make, delicious freshly baked, and also freeze quite well! 8 slices of bacon, chopped up or equivalent amount of bacon bits. Cook the bacon and place off to the side to cool. Use the lovely bacon flavoured oil to gently fry and soften your mixed vegetables. Mix the egg & milk; mix the flour, salt & pepper & backing powder; then combine the liquids with the flour mix and stir. Add in all the remaining ingredients - I aim for a rich coating of the muffin mix over the contents. Pour into individual muffin tray, ( you can sprinkle a little extra grated cheese on top if you want) and put into a preheated oven at 375 degrees. Cook for 15-20 minutes or until a spike inserted in the muffin comes out clean. Once the muffins are cool, you can bag them up in a ziplock bag and freeze for later use - if you can resist the yummy smells!